It is important to maintain the correct tire pressure for your vehicle during the fall and winter. Not only for safety purposes but also proper tire inflation can improve gas mileage between three and ten percent when maintained properly. Be sure to check your tires tread depth, and look over each tire for any bulges or bald spots. The performance of your car tires is critical to the safety, performance and efficiency of your vehicle. Keep your battery connections clean, tight, and corrosion free. Batteries do not always give warning signs before they fail. It is suggested to replace batteries that are more than three years old. Wiper blades are often one of the most neglected parts of a vehicle. Ninety percent of all driving decisions are based on a clear unobstructed view of the road, which means good visibility is absolutely essential especially during wet weather. If the wipers are chattering, streaking or otherwise failing to wipe cleanly and consistently, you need new blades. It is recommended to replace your wiper blades every six months. A recent survey by the Car Care Council stated that 14% of vehicles have belts that need replaced and 10% have hoses that need to be replaced. Most belt manufactures recommend periodic replacement for preventative maintenance. Replacing the belts periodically can go a long way towards minimizing the risk of a breakdown caused by belt failure. After all, it’s a lot easier to replace a belt at your convenience than having the belt fail unexpectedly. 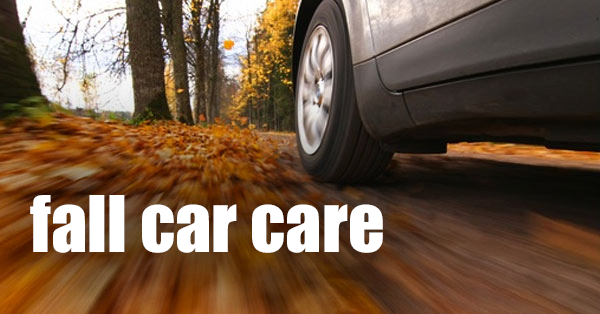 fall car care, vehicle maintenance. Bookmark.